The history of the Bethany Oratorio Society is long, distinguished, and includes some of the great musicians of their time. For nearly a century and a half the BOS has served as the backbone for the Messiah Festival of the Arts. Since 1881 members of the Lindsborg community and surrounding area have joined together to perform Handel’s great oratorio, Messiah. And since 1929 the oratorio society has performed Bach’s masterpiece, The Passion according to St. Matthew on Good Friday as part of the Messiah Festival of the Arts. This ensemble and these works have grown to become much more than performances but instead are essentials in the lifeblood of an already rich arts community. 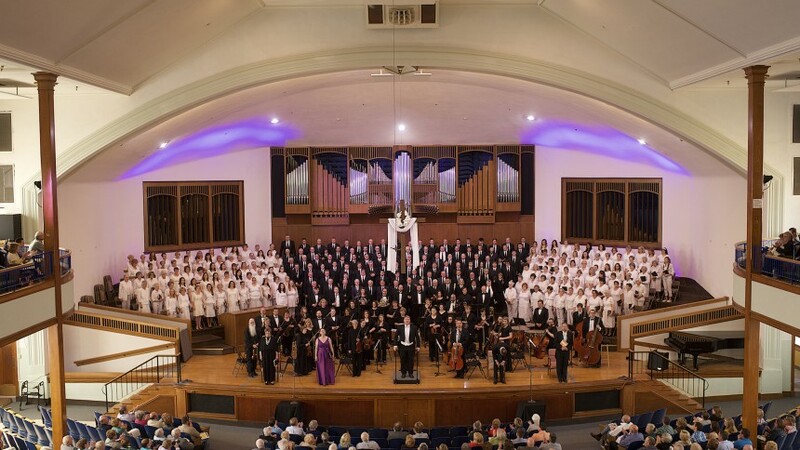 Professional singers are engaged to perform the solo roles in each work, but the 300 member chorus is made up of teachers, farmers, doctors, lawyers, and other members of Lindsborg, the Smoky Valley, and the surrounding area. A semi-professional/volunteer orchestra is engaged for performances of the works on Good Friday (Bach) and Easter Sunday (Handel). The Bethany Oratorio Chorus rehearses for 10 weeks in advance of Palm Sunday. Messiah chorus rehearsals are held each Sunday from 3:00 pm – 4:30 pm and the chorus for the St. Matthew’s Passion rehearses each Tuesday evening during that same 10-week period from 7 pm – 9pm. Are you interested in singing in this year’s festival? Contact me at lucas@bethanylb.edu or check here for a listing of rehearsal dates and times. To learn more about the full festival click here. To view a recent performance of a chorus from Messiah click here. If you would like to be considered as a soloist for one of the upcoming seasons please send materials via regular mail or email to the contact information listed below for Dr. Mark Lucas.